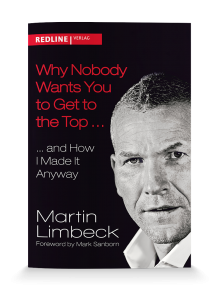 For over 23 years now, the Martin Limbeck Training Group has stood for thoroughly practice-oriented sales training. Under the guidance of our training team, you will gain incisive know-how in matters of personality, methodology, and leadership> in sales. This enhanced power provides companies with increased sales, better prices, and higher revenue. You will gain a partner who will be focusing on your specific sales situation and leading your team to the finish line. You are benefiting from genuine practitioners who provide you with knowledge gained in the field to be used in the field. In our view, a sales trainer is only a good sales trainer if he or she can sell to begin with and has the track record to prove it. And good is not quite good enough: The sustained education of our trainers is no less vital for our own company. Security through experience—since 1992 we’ve committed ourselves to the areas of in-house sales, field sales, and sales management. Ours isn’t a “hawker’s tray”—we have resolved to focus exclusively on sales in order to be a genuine partner in your ventures. In the fields of prospecting, new customer acquisition, cold calling, telephone training, price and condition negotiation, key account management, complaints processing, referral management, and closing-oriented negotiation, we are a benchmark in the sales world. Our seminars are tailored to our clients in such a way that our participants remain inspired by them. Thanks to the knowledge and skill of the trainers as well as the cutting-edge training methods we employ, we can ensure that the participants take pleasure in the experience of training, rendering them more motivated and successful in their work. Genuine learning instead of seminar tourism: We place great importance on providing you with real solutions for your imminent challenges. That is why we coordinate the seminar contents with you when preparing the training program, so that your needs and demands are legitimately met. The sustained dialog between our clients and our company before, during, and after the training process is of great importance for a successful training program. In this way we can ensure a timely and successful incorporation of your challenges into your seminar experience. Our seminars are characterized by the fact that our participants receive concrete guidelines and recommendations regarding the proper approach to the sales process. For you this means that you are not investing in a one-time motivational experience but receiving real alternative courses of action for your employees. You will close your deals—guaranteed! Our reasoning and course of action is success- and performance-oriented, and in our training sessions we systematically and meticulously work out the individual steps within the sales process. You will measure us by the measurability of our performance: No less than three times we were honored with the International Bronze Training Award from the German Association of Trainers, Consultants and Coaches (BDVT), and numerous cross-industry references also attest to our efficacy. With diagnostic instruments like 360-degree feedback, we offer you the possibility of reliably testing our performance as well as your own. Get to know us: live in the seminar hall, virtually through the online academy, or intensively through your customized LOOP process. Our work is not done until your team is ready to go. You can count on it.